When you think of the importance of patient wristbands, patient safety and positive patient identification is paramount. Accurate patient identification controls virtually every aspect of clinical care for the patient. 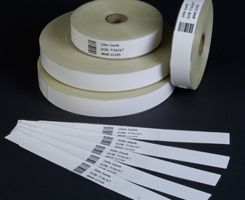 The Patient Wristbands offered by Ohio Identification Solutions, provide a durable latex-free polypropylene face stock and polyethylene liner designed to provide strength, durability, comfort and unmatched image quality for your patient identification requirement. The direct thermal Patient Wristbands provided by Ohio Identification Solutions are the perfect solution for your patient identification needs. Click here to contact us for more inforamtion about Patient Wristbands.